topped with a creamy caramel frosting making it one luscious treat. This was soft , moist and full of flavor. In regards to baking this cake ,the instructions are a little different than most cake recipes. This cake is baked at 275 degrees for 1 hour. I started preheating my oven before I made the cake to make sure it was nice and hot. My cake was golden brown and done at 1 hour. The next step…are you ready for this? Take the cake from the oven and put it in the freezer for 45 minutes. The reasoning behind this is that it makes a soft moist cake. I did put the cake in the freezer, but there were plenty of people that commented on the recipe from Food.com that said they didn’t and the cake was still moist. Don’t let putting it in the freezer keep you from making this cake. 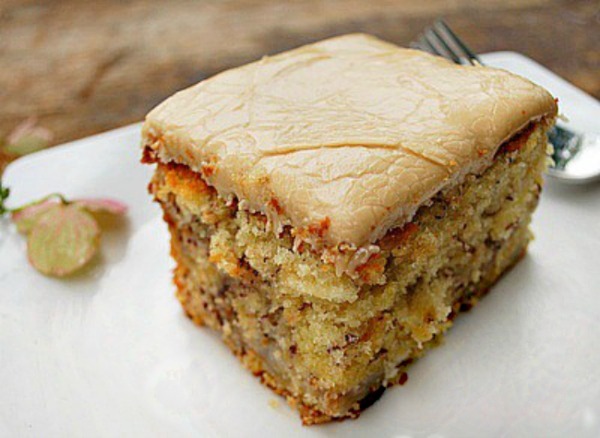 You can make it and not do this step and it will still be …The Best Banana Cake EVER! We start out making this cake by creaming the butter and sugar together. For new bakers, you don’t just mix it, you keep beating it until it is well incorporated and creamy. After they are creamed you add the eggs one at a time, mix till each egg is incorporated and then add the vanilla. Next the flour and buttermilk are added alternately, always start and end with the flour. Add a 1/3 of the flour – 1/2 of the buttermilk – another 1/3 of the flour – the last half of the buttermilk and then the final 1/3 of flour. Only beating until each ingredient is incorporated. That’s the trick to a nice soft cake. Look at that batter, it’s gorgeous! Thick , creamy and fluffy, just the way we want it. 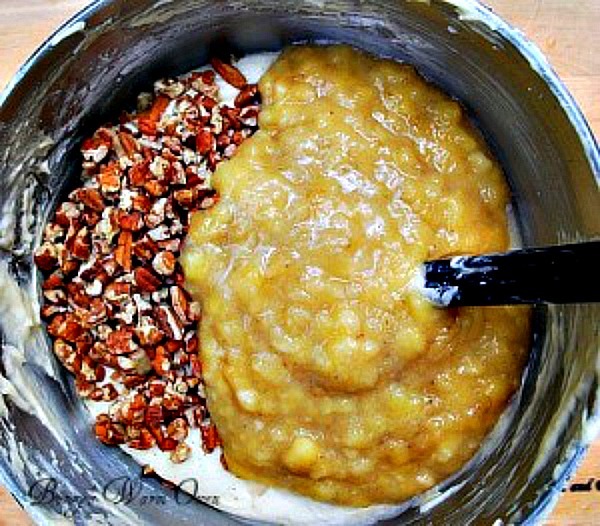 Our final step is to add the mashed up bananas and toasted pecan pieces, folding them gently into the batter. Place this gorgeous batter into a greased 9×13 pan and bake at 275 degrees for 1 hour or until the middle is set and it’s golden brown. And then, to freeze or not to freeze , that’s up to you. I frosted this cake with a very easy recipe from Paul Deen for Caramel Frosting. The combination of bananas, pecans and caramel frosting were wonderful! I hope you try this soon and love it as much as we did! Enjoy! In a large bowl, cream the butter and sugar until light and fluffy. Add the eggs, one at a time, beating well after each addition. Stir in 2 tsp vanilla. Add the flour mixture alternately with the buttermilk to the creamed butter/sugar mixture, beating until just incorporated with each addition. Stir in banana mixture and toasted pecans. Pour batter into prepared pan and bake in preheated oven for one hour or until toothpick inserted in center comes out clean. Melt butter in small saucepan. Add brown sugar and 1/3 cup cream. Cook over medium-low heat until the sugar is dissolved, about 2 minutes. Remove from heat and add vanilla. 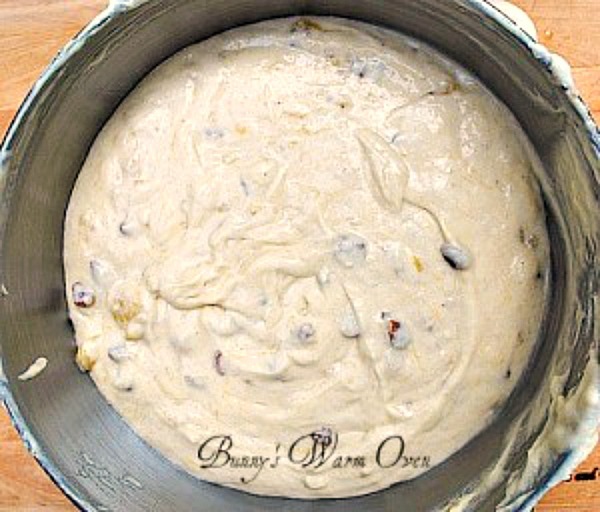 Transfer to a large bowl.Using a handheld electric mixer, beat in confectioners’ sugar a little at a time until smooth. 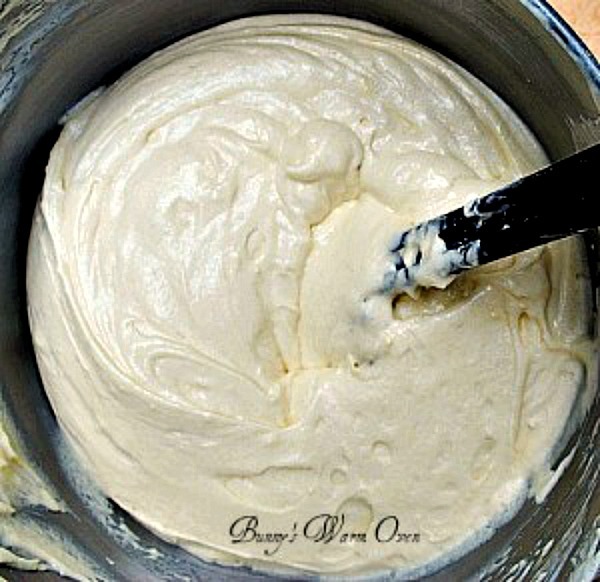 If frosting is too thick, add 1 tablespoon heavy cream at a time until consistency is right. can you use frozen bannas instead of fresh? Anonymous, Did you freeze fresh bananas? I think thawed frozen bananas would be fine in this. This is great with strawberry icing too. feipeng wu, thank you for stopping by! When you try it, please come back and tell me how it went for you! Anonymous, when I read your comment about the strawberry frosting it was like a light went on! YES!! Bananas and strawberry, how perfect is that! Thank you!! I have never heard of putting cake in the freezer to make it more moist, but I would love to try it. The caramel frosting looks yummy too! This is my daughter-in-law’s favorite cake. I had never heard of putting one in the freezer for any reason… But it is dang good! Oh you don’t know how happy I am this cake got some love! It’s fantastic isn’t it!! Thank you so much for coming back to comment on it, I hope your praise of the cake will help other people want to make it to! Will make this recipe but one question….bake at 275….is this an error. I baked at 275 for about 1 hr and 15 min checking every 5 min at the end. Good luck! Anonymous, The oven temperature is not a mistake, it’s 275 degrees. let me know how it goes for you! 9for 3 bananas) to get them soft enough but not hot……also cover a hot fresh cake with foil and seal the edges and the steam will have nowhere to go but back inside the cake……so moist!! Sunshine State Cooking, oh your going to love this cake! Thank you so much for sharing the Orange Cake and supporting me here! Will be by to see you! 275 degrees is that fahrenheit or Celsius ? Anonymous, yes 275 degrees fahrenheit is the right temperature. I couldn’t get mine to cook. It was in for 1 hour and 5 minutes @ 275 and the center was still liquid. I’ve turned the oven up and hope it gets done. It looks great …. Best Banana Pecan Cake!! I made it today, hubby loved it! Frosting was a little too sweet for me, but it was wonderful. Thank you!! Anonymous your welcome, it was one of my husbands favorites too! Looks delish! Can I make this into cupcakes, if so, does the temp and time change? Jeanette, I’ve never made them into cup cakes. The time of baking will be less obviously, I’d up the temp to at least 325. Let me know how it goes for you! I made this cake better a couple of days ago, frosted with Cream Cheese frosting. Made cupcakes out of it, 275 degrees (preheated oven first), cooked them for about 32 minutes. Didn’t place in the freezer, still very moist, When they were cool, I did put them in the fridge, frosted them the next day. Took them to a potluck, everyone loved them. I also added nuts, had walnuts on hand so that’s what I used. This looks amazing. I too freeze bananas. I don’t peel them, just throw them in a ziploc & freeze. They peel easily. Ruby we both have lots of bananas to bake with don’t we!! Thanks for stopping by! 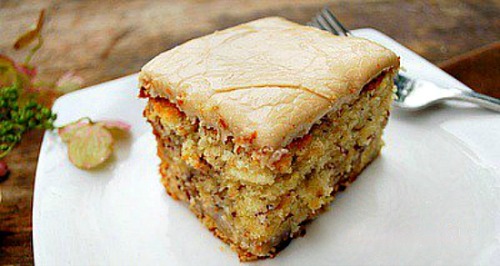 I LOVE banana cake and yours look delicious! Thanks for the recipe! Your welcome Ritchil, thanks for stopping by! Visiting from Saturday Night Fever. How moist does that cake look?!! Looks very moreish. I co-host Sweet and Savoury Sunday and would love for you to stop by and share this and other recipes with us. Have a great day! Ok this really does look like the best banana cake ever! Oh my goodness, it looks absolutely delicious!!! This cake looks decadent, I would be honored if you would share your recipe, in my recipe linky. This sounds so good, especially with the caramel frosting. I’ve never put a cake in the freezer either. Interested to try. Pinned! You will love what the freezer method does to the cake. it keeps the steam from evaporating and makes the cake very moist! Thank you for pinning! Thank you Debi! It’s one special cake! Thank you Kim, it’s a keeper! This is the same cake I have been making for years. Cooking at the lower temp does work. With some ovens you do have to bake a little longer than the time listed. Putting it in the freezer right after does make it moist. I do the same thing with most cakes and muffins I make. This is also the same frosting I have made since I started baking in elementary. You can use milk instead of cream. If you need to stay away from dairy, I suggest coconut oil in place of butter and almond or some other other kind of nut/rice milk in place of the cream. Your welcome, thank you for the opportunity to share! I can’t wait to give your recipe a try, it sounds amazing. Thanks for sharing at Fluster’s Creative Muster. Pinning! Oh wow, that cake looks amazing! The instructions do sound different but I would try it. Sometimes different is amazing. It is different Heather and it’s also AMAZING!! This looks yummy and super moist! I’ll be trying it this weekend! Looks amazing, thanks for sharing! You’re going to love this cake Alyssa, it’s fantastic! Vashti, thank you so much!! Ohhh . . . Yuuuummy!!! It’s 12 degrees and dropping in the beginning of another snow storm with 8 more inches expected here in Michigan…and your luscious banana pecan cake with caramel icing sounds absolutely divine right now!!!!! Keep warm Jeanne!! Stuck in the house with this cake…could be dangerous girl!! LOL!! This looks so yummy! Never heard of putting cake in the freezer, who knew? Beverly, yrs ago i was on a baking forum that had a lot of woman that had cake baking businesses in there homes. They all frozen their cakes straight from the oven saying that it kept the cakes very moist by keeping the moisture in. After making this cake I can definitely say it works! That looks super yummy! The caramel frosting is a great idea! Christi you’ll love this cake and the frosting, both together are dynamite!! That frosting looks to die for! Yum! Banana bread, cake, muffins…all a win in my book. Francesca the frosting…oh my gosh I could have eaten it with a spoon!!! I have had it in the oven for 90 minutes at this point, but it is still liquid in the center! The edges are getting dry , but the middle is raw. Still wondering about that low temp! Cathy let me know how it turned out for you. This looks delicious! I can’t wait to try it. Just one question – do you have to refrigerate this after its frosted? Hi Tammy, no you don’t have to put this in the fridge. Love the cake! Mine took about an hour and 15 min.the only issue I have is that the frosting is a little gritty. I cooked the butter, sugar and cream as directed if not a bit longer . Also there was not enough frosting to coat the split layers and fivsudes. I would make this again.? Dense moist (even with no freezer, refrigerated it over night before frosting.